Size of the Industry Today in India there are about 22000 plastic processing units and 150 plastic processing machinery manufacturers. 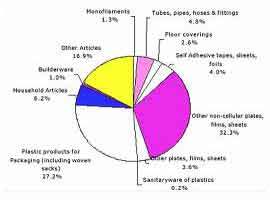 Percentage In World Market In the year 2006, the value of world plastic export was US$ 375 billion and the share of India was less than 1% with exports of worth US$ 3.187 billion. Market capitalization The per capita consumption of plastic products in India is growing and is moving towards 8% GDP growth. Ever since 1957, the Plastics Industry in India has made significant achievements as it made a modest but promising beginning by commencing production of Polystyrene. The chronology of manufacture of Indian polymers is summarised as under:- 1957-Polystyrene , 1959-LDPE ,1961-PVC , 1968- HDPE ,1978-Polypropylene. Such potential Indian market has motivated the entrepreneurs in the country to acquire technical expertise, achieve high quality standards and build capacities in various facets of the booming plastic industry. The Phenomenal developments in the plastic machinery sector is coupled with the developments in the petrochemical sector, both of which support the plastic processing sector. This has facilitated the plastic processors to build capacities for the service of both the domestic market and the markets overseas. 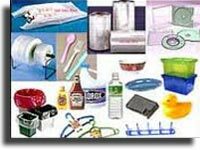 Today Indian Plastic processing sector comprises of over 30,000 units involved in producing a variety of items through injection moulding, blow moulding, extrusion and calendaring. The capacities built in most segments of this industry coupled with inherent capabilities has made us capable of servicing the overseas markets. The Indian plastic industry has taken great strides and in the past few decades, the industry has grown to the status of a leading sector in the country with a sizable base. Plastic material is gaining notable importance in different spheres of activity and the per capita consumption is increasing at a fast pace. Continuous advancements and developments in Plastic technology, processing machineries, expertise, and cost effective manufacturing is fast replacing the typical materials. On the basis of value added share, the Indian Plastic industry is about 0.5% of India's GDP. The export of plastic products also yields about 1% of the country's exports. The sector has a large presence of small scale companies in the industry, which account for more than 50% turnover of the industry and provides employment to an estimated 0.4 million people in the country. Approximately Rs.100 billion are invested in the form of fixed assets in the plastic processing industry. 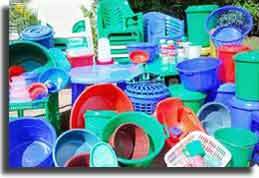 The Indian Plastic industry is facing severe demand crunch in the domestic industry for quite some time. Demand for major polymers was 10% lower in Q2 this financial year as compared to the same period last year. The slowdown demand is adversely affecting the industry comprising of 15 raw material producers and there are about 26,000 processing units in the country with adverse impact on the employment of 3.3 million people associated with this industry. The contribution of the plastic industry in the economic growth of countries the world has been great. With a population over one billion where 40% are under age 15, opportunities for plastics producers in India include near-term rapid growth in the nation's internal consumption of plastic products and the Indian middle class is 300 million and rising, and the annual GDP growth rate is 8%. Typically, in an emerging market, demand growth for plastics is 2 to 2.5 times the GDP growth. Sadly this is not the case in India where the growth at times has been lower than the GDP growth. The per capita consumption of plastics in India at 5kg is much lower than that of China which averages 25kg. But India could see very soon improvement in the production of Plastic. India today represents range of highly promising opportunities for growth of plastics producers worldwide. The fragmented plastics industry in India is beginning to consolidate, governmental regulations and trade barriers are coming down due to India's recent admission to the WTO, and some large North American plastics manufacturers have already begun doing business here. Today in India there are about 22000 plastic processing units and 150 plastic processing machinery manufactures. The machinery units supply over 2500 machineries per annum. In 198, the All India Plastic Industries Association was incorporated to solve various issue related to import duty of polymers. In the year 2006, the value of world plastic export was US$ 375 billion and the share of India was less than 1 % with exports of worth US$ 3.187 billion. During this same period the percentage of growth in export was 21%. During this trend of growth in exports, the exports of plastic raw material increased from 55% to 60% of the total export of plastic goods, while the export of processed plastic goods was a negative growth from 45% to 9%. According to recent reports of analysts, the industry is said to be losing an opportunity of USD 300 million through value addition on the raw materials that are exported. Indian Plastic Industry today is symbolizing a promising industry and at the same time creating new employment opportunities for people in the country. The per capita consumption of plastic products in India is growing and is moving towards 8% GDP growth. Finolex Industries Ltd. It can produce 90,000 metric tons of pipes each year. Plastiblends India Limited is renowned as India's pioneer Masterbatches manufacturer. Corporate Resource Group is one of the leading suppliers, exporters and manufacturers of plastic instruments and pipettes in India. ACRY Plus company exports, manufactures and supplies acrylic plastics sheets, polycarbonate sheets, polycarbonate multi-wall sheets and PVC foam sheets. Students who are interested to pursue the career in area of Plastic Technology must have completed 10+2 with physics, chemistry and mathematics. A good Plastic Technologist can specialize at the graduate level through a BE course in Chemical/Polymer engineering or a B.Sc. course in Chemistry followed by B.Tech./Diploma in Plastic/Polymer Technology. Graduation in Chemical/Polymer engineering with Chemistry are eligible for postgraduate courses in Plastic/Polymers technology. One has to pass GATE for getting admission into the postgraduate course. Apart from these opportunities production, management and marketing are other functional areas and entry in these areas should not necessarily demand a background in Plastic Technology. Jobs in Plastic industry community is created where knowledge is shared among the community on latest development in plastic industry. The Indian Plastic industry is at the verge of high growth rate over about 10%-12% which is contributed by high growth rates, in turn, from the end-user industries. This trend has mainly been driving the automotive sector, since the economy is already showing signs of recovery from the downturn. As the Plastic industry is heavily dependent on automotive sector, launching of new cars in the small segments are expected to drive the demand for plastics. India is likely to dominate the rest of the world's Plastic with the domestic per capita consumption set to double by 2012. As the domestic Indian Plastic Industry expects for the investment of nearly $80 billion over the next four years. Indian government has identified the petrochemicals industry as a 'high priority' sector, as it is owing to the fact that plastics play an important role in providing the basic necessities for everyday use, while it is conserving the scarce natural resources. Plastic plays a significant role in the key sectors of the economy, including agriculture, water management, automobiles, transportation, construction, telecommunication and electronics, besides defence and aerospace, computers and power transmissions. As of now the Indian Plastic industry has enormous potential for growth as polymer use in India is far below the world level. With increasing competition in the global market and the constant drive to improve our living standards, the scope for use of plastics is bound to increase manifold and make the production double in the coming years.